State lawmakers have finally taken steps to try to complete the American Indian Cultural Center and Museum in Oklahoma City. That’s a positive development. Under legislation recently approved last week by the House and Senate, the state pay would pay $25 million in bonds, and then essentially hand over the stalled project to Oklahoma City, which would manage the AICCM and reap the benefits of economic development along the riverfront property at the intersection of I-35 and I-40. In essence, the state is washing its hands of the project, which stopped construction way back in 2012. That’s not so positive. The state’s control of the project held symbolic value that resonated with many Oklahomans. I’ve seen different estimates of how much the state has already put into the project, but it was at least $67 million as of 2014. Oklahoma will eventually invest more than $100 million on the project, according to government leaders. For the state to simply give up now with a last infusion of limited money isn’t necessarily the best move in terms of national perception of the Oklahoma legislature and overall government, but at least it will probably get the project moving again. As I’ve argued in the past, the AICCM is more than just a tourist draw and stupendous educational center. It’s also an extremely small gesture of reparations to native nations in the state, which have contributed to the project. 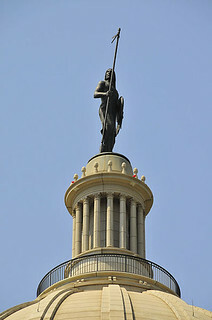 It also recognizes the unique role Oklahoma played in the European colonization of the United States and the 1830 Indian Removal Act, supported by often-criticized President Andrew Jackson. Under the infamous act, thousands of Indians were forcibly moved from their lands in the southern U.S. to areas in Oklahoma. The purpose of this was to open up land for white “settlers.” Many Indians died on their journey here and then continued to face various, insidious forms of discrimination. Keep in mind, the AICCM is NOT an Indian-sponsored project despite the contributions from various native nations. It was designed as a way to attract people here and also to honor the contributions of native people to Oklahoma and U.S. culture. My first reaction to the deal is that Oklahoma City is the big winner in all this and should seize the opportunity to complete the project and develop the acres of land surrounding the project. If Oklahoma City accepts the deal, it would have to kick in at least $9 million and take over operating costs in 2016. I hope that the deal doesn’t lead to scaling back the project in some manner or that the whole project doesn’t become overly commercialized. The success of the AICCM will be its world-class magnitude and its historical and academic integrity.